Humans have an amazing memory when it comes to pain. But, there is one thing that sticks out much more than anything else. I mean, physically getting burned by something hot. As you may know, I used to be a professional firefighter for a major city in California. While over 90% of the emergencies we responded to were non-fire related, it was the structure fires that were by far the most dangerous. So, just like any profession, you train for the worst case scenario. You repeatedly review techniques and skills to ensure that you can handle whatever you’re challenged with. Basically, it’s two shipping containers that are joined together, with one container positioned higher than the other. 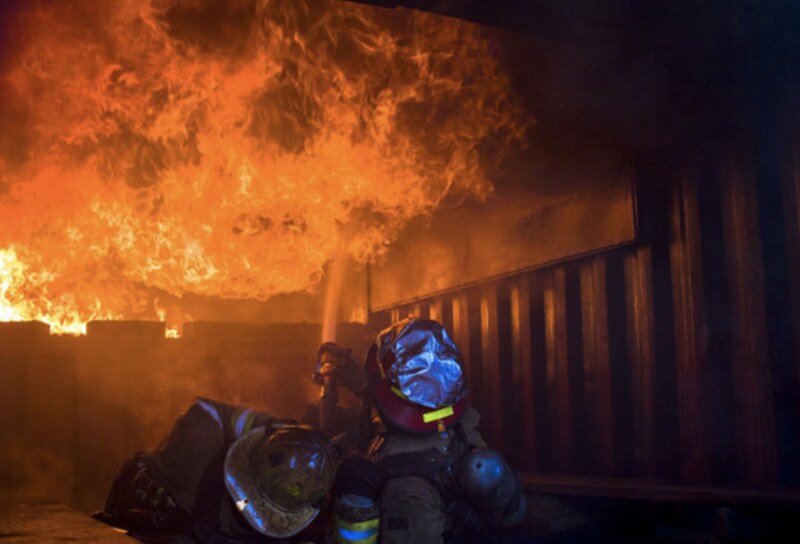 In the container that is elevated, a fire is ignited, while a bunch of firefighters sit in the container below. As the fire grows, a significant amount of smoke starts to get produced. At this point, there is a door at the end of the lower container that is opened or closed to allow more or less oxygen into the containers. An open door allows lots of oxygen to flow in and allows the fire to burn intensely. When the door is closed, the fire is starved from oxygen and more smoke is produced because there is incomplete combustion. If you keep the door closed for a while, the container starts to fill up with thick and nasty smoke. This smoke starts to ‘bank down,’ meaning that it first stacks up against the ceiling and it slowly gets lower and lower. When you’re in the container, you have to sit down because the air is so hot near the ceiling, it will melt your equipment. As the fire continues to burn while the door is closed, the hot smoke continues to ‘bank down’ towards the floor. It starts to get so hot inside the container that all the firefighters almost lay down to get closer to the cooler air. Then, when someone slightly opens the back door, air rushes in and provides fresh oxygen to the fire. This oxygen is what the fire is craving and it ends up igniting all of the smoke that is the air. This is what is knowns as a ‘flashover.’ Basically, all of that smoke is the product of incomplete combustion, so when it finally gets oxygen it all ignites. This is the worst case scenario if you are a firefighter. For example, if you go into a burning house and the smoke is very thick and oddly colored, it’s an indication that the fire is not getting the air it needs. And when it does finally get the air, it can react with explosive energy. If you’ve ever seen the movie Backdraft, then you’ll know what I’m talking about. A ‘backdraft’ is basically the same thing. It’s a fire that has been starved of oxygen and is producing thick, oddly colored, very flammable smoke. Then, as soon as oxygen is introduced, the entire room ignites. So, as a firefighter, you not only want to know when a flashover is going to happen, but you also want to know how to avoid it all together. 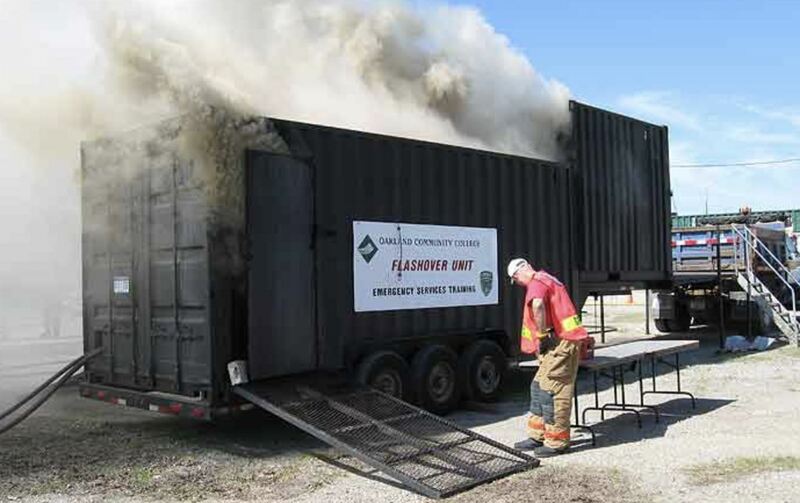 And that is why there is a flashover chamber that is used for training. I’ve been inside of a flashover chamber many times, but I’ll never forget the first time. Sitting there in the chamber, my boots were pointing towards the fire and I was leaning back against the inside of the shipping container. About 15 minutes into the drill, everyone in the container starts to constantly reposition themselves. It gets so hot inside that you have to make small movements so that your equipment is not constantly getting the same heat exposure. Then, about 20 minutes into the drill, I realize that my face mask is starting to crack. The heat is so intense that the plastic and rubber on my equipment is starting to melt. And I could feel the top of my boot getting very hot. The same thing is starting to happen to other firefighters in the chamber, so they end the drill and everyone crawls out. What I didn’t realize was that the top of my boot had gotten super hot. The position that I was sitting in didn’t allow the top of my foot to actually touch the boot. But, when I started to crawl out of the flashover chamber, the top of my foot made contact with the boot. That’s when I started to crawl as fast as I could until I was outside the container. As soon as I made it out onto the asphalt, I laid on my back and tried to rip off my boot. Keep in mind, I am wearing full firefighter turnouts, an SCBA (self contained breathing apparatus), and everything on me is extremely hot. So, I’m rolling around on the asphalt trying to rip my boot off, while the entire time my foot is getting burned. Finally, I get the boot off, then rip my sock off, and find a massive blister on the top of my foot. But… the pain isn’t gone. It continues to burn even though there is nothing hot touching it. It’s a pain that I can’t describe… and it stays intense for over an hour. I still have a scar on the top of my right foot today… and this happened almost 10 years ago. I will never forget that pain. It was such a unique and intense pain that it is engrained in my mind. If you’ve never been burned before, then it’s impossible for you to relate. Likewise, there are many painful things that I have not experienced that I can’t relate to. However, whatever pain we have individually gone through will forever be in the back of our mind… and we will try to always avoid that pain in the future. Your future decisions will be largely based on your past pain. In this sense, past pain is a good thing. It’s experience. Past pain will allow you to make better decisions in the future. That’s why reading is such a great habit. You often get to learn about other people’s mistakes and how they avoid making the same mistakes in the future. The only problem is that even though you may try very hard to learn from other’s experiences, you only really learn when something happens to you. Millennials essentially entered the working (and investing) world right when markets fell apart in 2008. 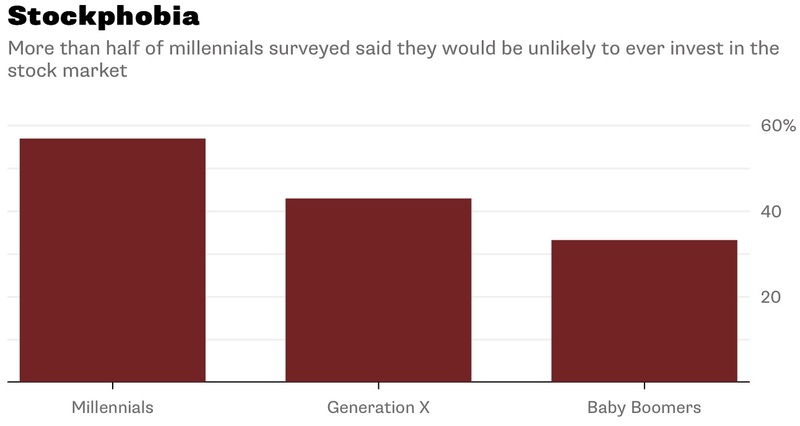 Watching their parents retirement accounts evaporate, seeing their friends lose their homes, and trying to get a job in a weak market is what millennials remember. That’s why they’re resistant to putting their hard-earned money into the stock market. They’ve seen it fall apart before. Can you blame them? This recent selloff in the stock market should be a good reminder of what can happen to an overheated market. We’ve had almost 10 years of continuous growth since the last financial crisis. Cyclically speaking, we are ‘due’ for a correction. But, no one knows the exact timing. Instead of trying to time the market, start to look at other opportunities. The stock market should only be one part of your larger portfolio. Right now there are many other opportunities that are screaming buys right now. Foreign real estate, silver, and agriculture commodities are just a few. If you don’t remember the pain from the last financial crisis, then you’ll learn from the next one.